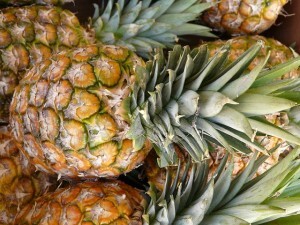 Choose a pineapple that looks fresh and plump and has leaves that look fresh and green rather than dried out and brown. Check the pineapple for a sweet fragrance, if there is no aroma then it is not ripe, if it smells fermented or has an aroma of alcohol then it should be avoided. Once a pineapple has been picked it will not continue to ripen. The color of the outside of the pineapple is not an indication of ripeness, a pineapple that still appears to be green can be sweet and delicious to eat. The bigger the pineapple the more edible fruit will be inside but size does not indicate taste. Fresh pineapple can be kept at room temperature for only a couple of days. To extend the shelf life store pineapple in a perforated plastic bag in the refrigerator for up to a week. Cut pineapple should be stored in an airtight container in the refrigerator. Cut the pineapple into desired slices or pieces, place pineapple pieces in a single layer on a baking sheet and place them in the freezer until the pineapple is frozen. Once frozen, put the pineapple pieces in freezer containers and store in the freezer. 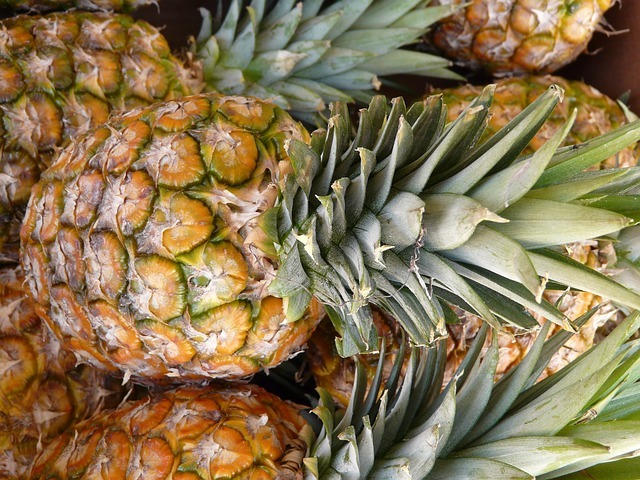 When pineapples have been left on the vine long enough, it is still possible to ripen further at home, though the level of sweetness will not change. Pineapples are best ripened at room temperature. Place the pineapple upside down, standing on the leaf end, on the counter. When placed on their base pineapples have a tendency to rot. After a couple of days, when the green color of the pineapple has turned to yellow or tan and it has a tropical aroma it is ready to eat.